Just looking at the elegant bottle, with an inviting residue of frost, the beautiful label, and the anticipation of the exploding bubbles makes our spirits and hearts swell with delight – as we know that something special awaits us, and that things might indeed be better than we think, and that they have just gotten a heck of a lot better. 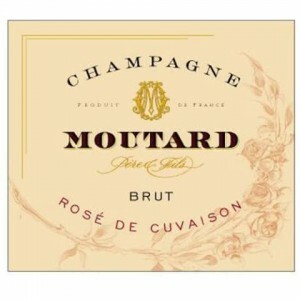 An exceptionally exciting that we’re featuring is the Moutard NV Brut Rosé de Cuvaison – an absolute steal at under $30. What an amazing Champagne you will find here – I know I have preached the virtues of Rose’ Champagne previously, but if you still haven’t tried one, this is an absolute must-do! I always say that you get everything you love about Champagne, with the additional delight of a dry wisp of flavorful raspberry added along. What possible can there be not to love? And this is in limited amounts, so you need to get on this quick! Introduce this to your friends that haven’t tried it before, and you’ll be seen as a bon vivant and authority figure for life. One of my favorites to pair with Champagne is Thai food (Hong Kong style Chinese, very abundant in Monterey Park is fantastic too) – the delicate flavors that would be bombarded to oblivion with many California red wines are perfect with the light and crisp acidity, creamy bubbles, and bitter blood orange and berry nuances. “A rosé of pinot noir from the Côte des Bars, this gains its color from a short maceration on the grape skins. The ripeness of the fruit comes through in exotic spices,…The red fruit flavor is tight and savory, without even a whisper of sweetness, lasting with gentle, quiet persistence.” Wine & Spirits, 93 points. “Ripe raspberry, cherry, graphite and blood orange notes leap from the glass, riding a satiny bead and married to mouthwatering acidity on the palate. Bright and expressive, with a chalky, lingering finish. Drink now through 2020. 5,000 cases made.” Wine Spectator, 92 points. “The house’s NV Brut Rose de Cuvaison is another standout. Tar, smoke and game are some of the aromas and flavors that emerge from the glass, adding considerable complexity and nuance. A short maceration on the skinks gives this 100% Pinot Noir Champagne its volume and breadth. Richness and sophistication meld together beautifully here. This is a standout from Moutard.” Wine Advocate, 92 points. 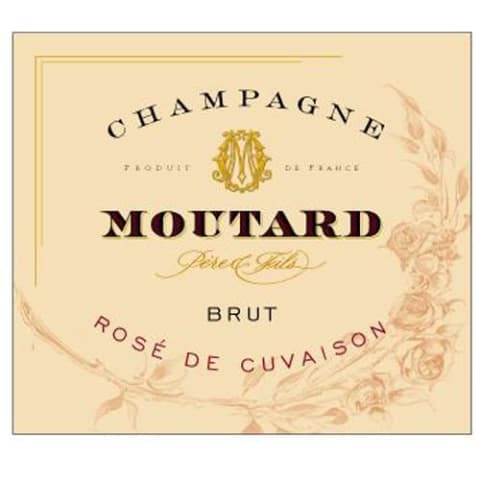 “Moutard has been making wine for several generations, producing a range of Champagnes from their own grapes and from grapes purchased from vine-growing friends. The Cote des Bar soil, made up of clays and limestones, gives the traditional Champagne varieties – Pinot Noir and Chardonnay – those very special rich, fruity aromas which are so much appreciated by connoisseurs. The blending of wines kept from several years enables us to offer a range of Champagnes of reliable quality. So that we can offer Champagnes at a perfect stage of maturity, ready for drinking, our production is cellar-aged for at least three years or between ten and fifteen years for vintage wines. From the beginning of the wine-making process to the first sign of sparkling, our ancient methods have been enriched by the latest techniques in controlling the quality of the products.